Embarrassing Tan Lines - No More! Say goodbye to embarrassing tan lines instantly with Tanee the tan line corrector. Tanee will disguise unwanted tan lines until your tan naturally fades. 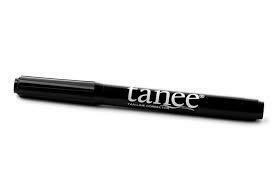 Tanee is a revolutionary 2-in-1 bronzer and sunless tanning liquid in a compact cosmetic pen. In just a few strokes Tanee camouflages tan lines, streaks and spots. It’s as easy as coloring in the lines! Tanee’s precision, no-mess applicator covers tan lines perfectly and keeps your hands and fingers clean. There’s more than enough to cover even the biggest tanning blunders! Try Tanee today and you’ll agree it’s the “Best Thing in Tanning Since the Sun”. Ensure tan line area is clean and dry. Fill in tan line area with Tanee’s precision applicator. Wait to dry. Re-apply as necessary. Multiple applications will deepen the tan. Enjoy your beautiful tan with no tan lines! Tanee is a combination of an all-natural instant bronzer and sunless tanning solution. Tanee’s long-lasting results are from its unique blend of plant derived DHA, caramel color and black walnut extract. DHA (Dihydroxyacetone) is the most common active ingredient in sunless tanners today, and is derived from sugar beets and sugar cane. DHA works on the skin’s outer layer (epidermis) that renews itself daily by sloughing off the top layer of dead skin cells. The color from both a natural tan and the Tanee eventually fades as the skin renews and exfoliates. Discovered to be a temporary skin-coloring agent back in the 1920’s, DHA was first sold in 1960 as an over-the-counter sunless tanning product. In the 1970’s the Food and Drug Administration added DHA to its list of approved cosmetic ingredients. By the late 1980’s innovations in DHA’s refinement process yielded higher quality and more predictable (browner, less orange) results. Since then, DHA technology has further improved and is why the Tanee can provide flawless tan line coverage. My Experience: I was sent a sample of Tanee for review. I have not yet been out in the sun this season and so I have not had the need to use it. However, my daughter will be going to Walt Disney World after she graduates in June. (I know, lucky girl. She is going with Dad and I am staying home. Bummer for me.) Anyway, I am sending my daughter with plenty of sunscreen, but if by chance she gets suntan lines, I will make certain that she has the Tanee pen on hand to use to correct any embarrassing tan lines that she may receive.